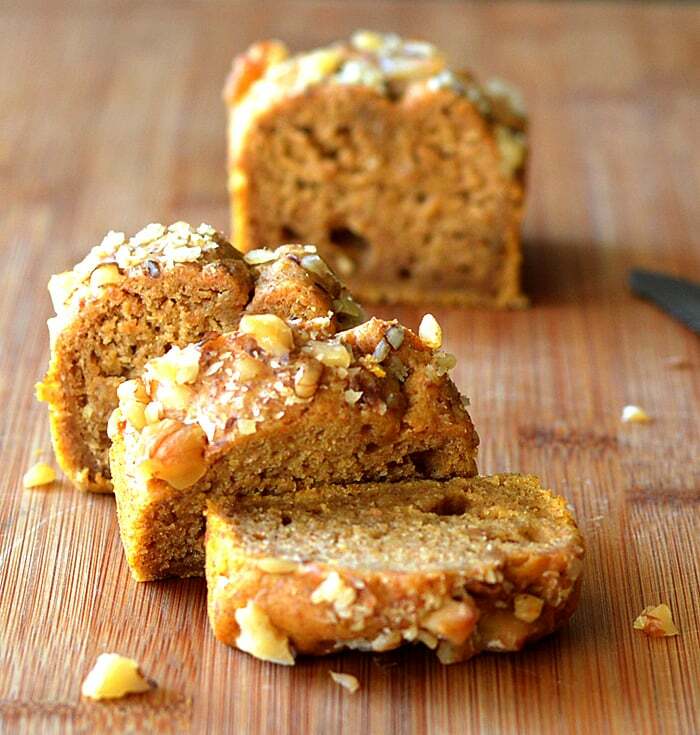 It’s that time of year and I have pumpkin recipes GALORE planned for you…starting with this one! 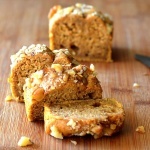 Pumpkin Banana Nut Bread. Served warm (or cold), this is a really moist version that is amazing just with a bit of vegan margarine on it. I topped it with a mixture of chopped walnuts and brown sugar, but you could choose to use pecans if you prefer. Additionally, you could choose to spice this up more than I did. Nutmget, ginger, etc. along with the cinnamon. 1/8 C Oil Coconut, Grapeseed, Canola, etc. Combine the brown sugar and chopped walnut mixture. Set aside. In the bowl of an electric mixer, combine all ingredients for the batter. It should be very thick like a traditional banana bread. Do not overmix. Pour into desired pan(s) and top with the sugar/walnut mixture. Press into the batter. As they rise during baking, the nuts tend to get pushed out a bit and will fall off. We want them to adhere to the batter so they are embedded after baking. Bake until a toothpick inserted comes clean. About 50-60 minutes for a full loaf, and maybe half of that for the mini loaves. Thank you for this *perfect* autumn recipe! I like walnuts in mine, so I went ahead and mixed them in. I’m so glad you enjoyed it 🙂 Thanks for stopping by. Thank u! Perfect way to use left over pumpkin and banana. So delicious!!! I used cardamom instead of cinnamon, allergic. Awesome recipe!!!!! !